I love pizza. You love pizza. We all love pizza. If you want to show off your love for pizza this is the t-shirt for you. 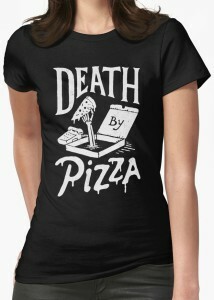 On the front of this shirt you see the saying of “Death By Pizza” with a box of pizza and a skeleton hand holding up a piece of pizza. This t-shirt has a choice of 18 different fun and vibrant colors. Available in a wide selection of women’s fitted sizes that range from Small to 2XL and get the death by pizza on the front or back. Also check out all of the different shirt styles to get this print on form men’s fitted to hoodies and more.